Hi! 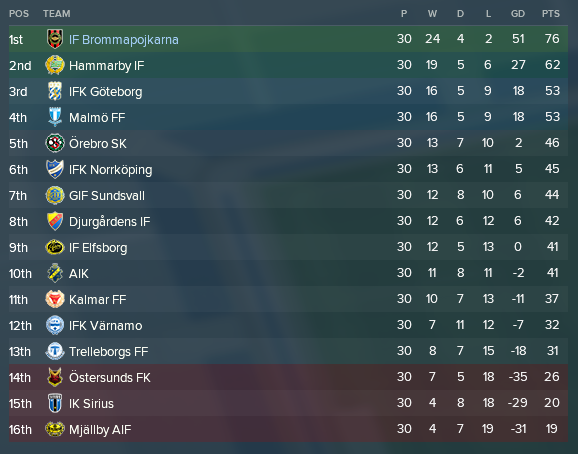 MikaelinhoFM here with the eighteenth episode of my first ever FM18 blog “The Bromma Boys” about Swedish talent factory Brommapojkarna, and I must say that I’m really loving both the save and this blog series. If you missed last seasons’ updates, do go back and read them through the links below. This episode covers the entire 2024 season. Last season we won our second Allsvenskan title in a row, which means that we get to play some Champions League football again. Our first Champions League adventure last season went ok I guess. We managed to qualify for the group stage but finished dead last in the group. This season I’m hoping for another Allsvenskan title and at least a third-place finish in the Champions League group stage, which would qualify us for the Europa League knockouts. We got quite a few players in ahead of this season. Most of them are Academy prospects or tutors (marked with yellow dots), but two players were bought for the first team; Carlos Antônio and Tobias Jönsson. Comment: With pretty much only two real central defenders in the squad and no Academy players good enough for first team football I was on the hunt for some new talent that could perform for us from the get-go. I was so satisfied when I found Carlos Antonio, even though he is most comfortable in a DM position for now. I will train him as a ball playing defender, hopefully developing his defensive attributes a bit, while at the same time taking advantage of his great attacking skills! Comment: We really wanted and needed a new right winger with Lucas Crispim getting old and Martin Högberg out with a long-term injury. When Jönsson started kicking up a fuss about wanting first team football at Glasgow Rangers, we struck like a cobra! The transfer fee is high, but I feel that he is pretty close to a complete right winger at the early age of 19, with a great BP Style Rating and nice Crossing. Hopefully he’ll perform for us for many years to come. Eleven players were loaned out, but not a single permanent transfer, so really nothing to report here. 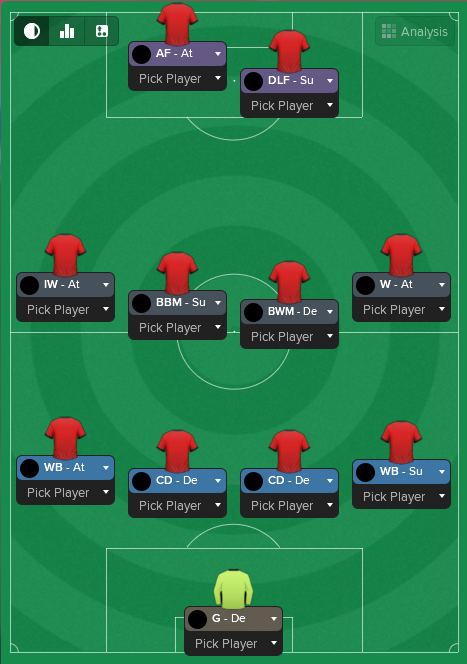 With last season’s tactical disaster fresh in my mind I decided to make things simple and start fresh with a new tactic that I could use for the long run. I ended up with this quite unsexy 4-4-2 that shared a lot of similarities with the tactic that gave us six straight wins to end last season. I still want to use the same principles that I’ve stuck to since starting the save; a technical fast-paced attacking football with an aggressive defence. This tactic looked fairly solid throughout the pre-season and I had high hopes that it would work well when things got more serious as well. Since we were knocked out of the Champions League group stage last season this season started off with the Swedish Cup. We breezed through the group stage again, comfortably beating Allsvenskan side Trelleborg, 2nd tier team Helsingborg and 3rd tier team Piteå. We have come to the point where I never really contemplate us not getting through to the knock-out stage anymore. I pretty much treat it like pre-season games I know we are going to win. We were drawn against 3rd tier team Åtvidaberg in the quarter-final, a really easy draw. We dominated the game from the start, going 3-0 up before halftime. They came back with 2 goals within 5 minutes at the beginning of the second half, but our win was never in any danger. Lorshag scored his second and third for the night, securing a 5-2 win. We got another decent draw in the semi-final against Allsvenskan side GIF Sundsvall, but were absolutely out-played in the first half. We were down 0-1 but it could have been more. A few tactical changes saw us come out in the second half as a new team, scoring twice in four minutes to take the lead. However, in the 70th minute we got a man sent off, which Sundsvall really capitalised on by scoring three goals in the final 20 minutes. A really disappointing loss against a team I feel that we should beat any day of the week. After our back-to-back Allsvenskan titles the media has finally started taking us seriously. We are predicted to win it all, which is exactly the same as my expectations for the season; winning that third straight title! We started off shockingly bad conceding to Elfsborg after 14 seconds and again after 15 minutes. The game was looking just as one-sided as the Swedish Cup semi final, and played out pretty much like it. We got back to 2-2, got a red card and then conceded one more goal to lose 2-3. We went on to lose the second game against Malmö as well, before securing our first win. Despite the win, we looked really unconvincing in this game as well and I had to face the fact that our new 4-4-2 formation wasn’t working as we had hoped. I didn’t want to scrap it as I really believed that I was on to something. The fact that both the U21s and the U19s were smashing their oppositions using this tactic strengthened my notion. I went back and watched the last couple of games and noticed a few things to improve. I went with a more narrow formation since I felt that we had been overrun with too many through balls in defence and moved our ball-winning midfielder into the DM position to stop direct counter-attacking passes from reaching the space between defence and midfield. I also told the players to slow the passing down just a notch. This really worked wonders for us, with us possibly playing our best football ever against Norrköping and Göteborg in the following games, earning us two secure 4-1 wins. As you can see above we just kept going from that point, going unbeaten for the rest of the spring. We went into the summer break top of the league, four points ahead of Hammarby and a nice nine points ahead of Malmö and Göteborg. Considering that we’ve historically played worse in the autumn than the spring I was a bit worried that Hammarby might catch up! Our rise in reputation combined with our newly won Champions League status has had a very nice effect on the valuation of our players. All of a sudden our player values have more than doubled and the bids coming in for our best players have risen from €3-4M to around €10M. Morten Olsen, our number 1 left-back, left for Newcastle in a deal way better than anything we’ve been offered before. €9M up-front and a 50% sell-on clause gives us both a lot of money straight up and the possibility to earn more, exactly the kind of deal I like! 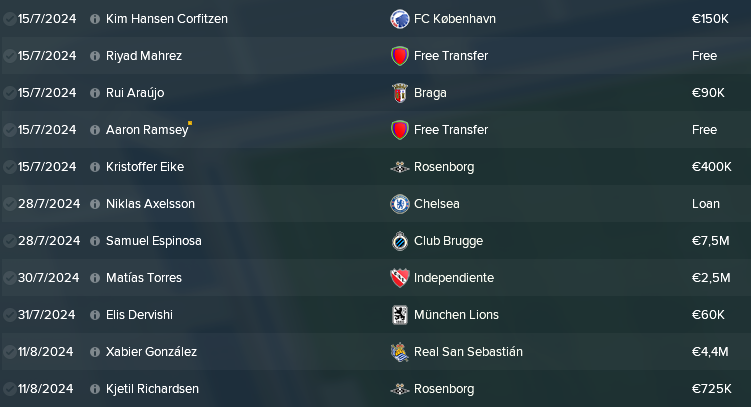 In a very similar move we sold our number 1 right-back Karamoko to Freiburg for €10M up-front and a 50% sell-on clause, making this deal the biggest sale EVER from an Allsvenskan team! We also got some nice cash through our 50% sell-on clauses when Malmö decided to spend €6M by bringing in former BP Academy player Lado Archvadze from Frankfurt and when Juventus signed Australian wonderkid Lewis Park from Belgian side Genk for a fee of €20.5M. We made a couple of temporary exceptions to our rule of not signing players over the age of 21. A lot of experienced and still quite decent players became available as free agents and I wanted to sign a couple to help our young squad a bit. We managed to sign Aaron Ramsey and Riyad Mahrez. Perhaps we weren’t primarily needing more players in the midfield, but I hope my veteran signings will contribute with some much-needed experience going into another season of Champions League football. They are both starting to decline physically, but mentally (at least Ramsey) and technically (at least Mahrez) they’re still great! We were also in contract negotiations with Swedish internationals Pontus Jansson and Emil Forsberg who chose to join other clubs and international veterans Alexis Sanchez, Serge Aurier, Stephen el Sharaawy, Erik Lamela and Christian Benteke who all wanted too much money in comparison to what they would contribute in my opinion. Thanks to our newly found wealth, we splashed some serious cash on a few really exciting Academy prospects that look like they’re at least one level better than the players we’ve been able to acquire earlier. Both Espinosa and Gonzalez come in as sixteen-year-olds brimming with potential, while Argentinian Torres joined us on his 18th birthday. They will all be presented in-depth in the upcoming Academy Report episode. 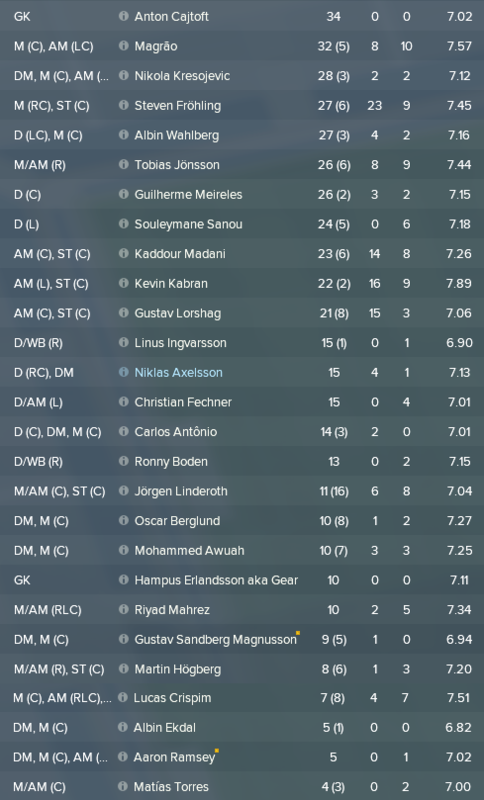 We continued to look like a well-oiled footballing machine after the summer break and pretty much killed all excitement after beating Hammarby in gameweek 25, even though they put up a good fight with 2 goals from former BP Academy player Tarek Lugavic after 2 assists from former BP Academy player Amara Koné. With five games left to play we were an impressive 16 points ahead of 2nd placed Hammarby, which meant that we just secured our third consecutive Allsvenskan title! The domestic dynasty I’ve been rambling about is slowly but steadily becoming a reality! 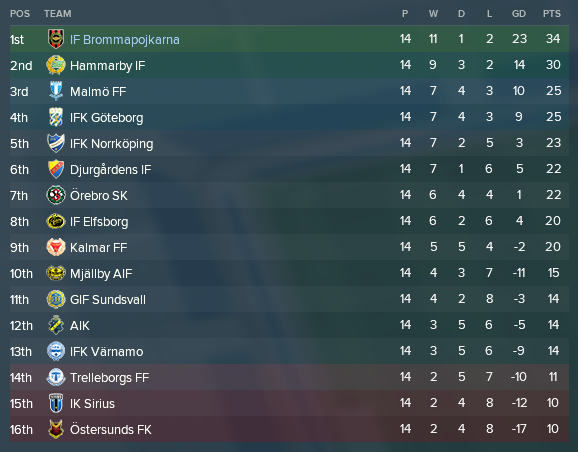 After an awful start to the season, we finished with a record high 76 points, 14 points ahead of Hammarby and a whopping 23 points ahead of Göteborg and Malmö! For the second year in a row we got into the Champions League group stage, this season after comfortably beating Greek side AEK Athens in the play-off round. We got a fairly tough group with Red Bull Leipzig, Tottenham and Real Sociedad. We lost our first game away to Red Bull Leipzig 0-2, not much to argue about really. In our second game, we took a surprising yet deserving 2-0 lead at home to Spurs but absolutely fell apart in the second half conceding four goals and losing 2-4 despite six clear-cut chances! We won our third game of the group away to Real Sociedad with Brendan Rodgers as manager. In the last three games we didn’t really reach our up to our usual standard, which disappointingly means that we finished the group in fourth place, putting an end to this seasons European cup run. Young striker Steven Fröhling really got his big breakthrough with 23 goals and a nice 7.45 average rating. Other attacking players that stood out were the usual suspects. Lorshag, Kabran and Madani all bagged 10+ goals and performed as expected. Our veteran summer signings turned out ok. Mahrez made a bit of an impact with 2 goals and 5 assists in 10 games, but Ramsey didn’t do that much with only 5 games and a 7.02 average rating. I will probably be moving them both along since I don’t feel that they contributed enough to earn their fairly high wages. Young Brazilian midfielder Magrão has become a fan favourite and won the Fans’ Player of the Year Award with a whopping 61% of the votes. A good season for us, but the feeling is that we hit a plateau in our development! We are really building on our domestic dominance with our third league title which is very nice. However, it’s obvious that we’re quite far behind when it comes to the European scene. Hopefully the increasing level of the players coming through our Academy in coming years will help us close the gap. Read more about them in the following Academy Report! In the next episode we will take an in-depth look at what’s been cooking in the Academy, aka the Talent Factory, during 2024. What new gems came through the intake? After a quite disappointing “Class of 23”, will the graduating “Class of 24” be the start of a golden generation? What’s happening to Grass and Gear? The only way to find out is by reading the next episode! Thanks for the read, I hope you liked it as much as I did writing it! 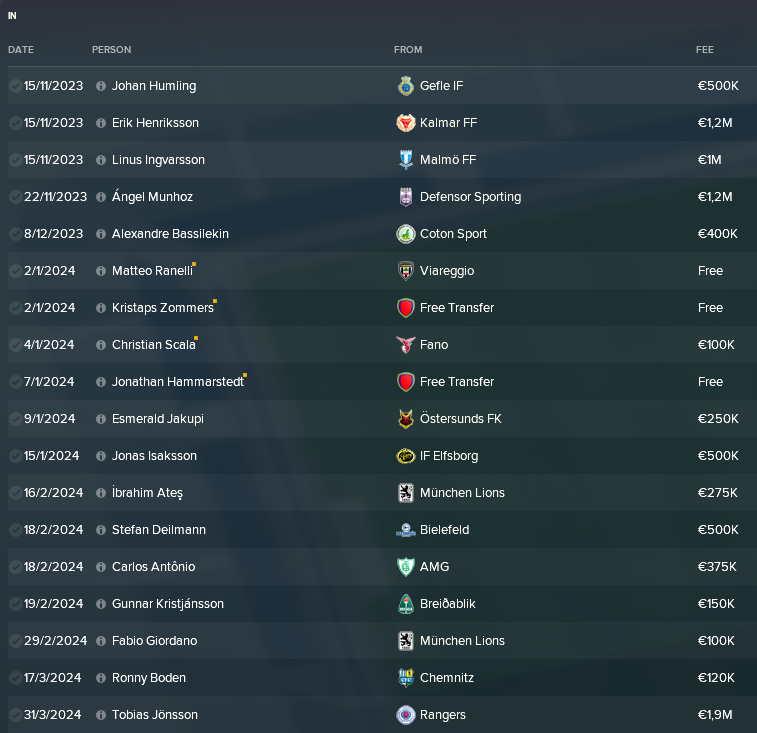 This entry was posted in FM18 Stories, Football Manager 2018, The Bromma Boys | @MikaelinhoFM and tagged brommapojkarna, champions league, europe, fm stories, fm18, football manager, sweden, swedish allsvenskan, swedish cup. Bookmark the permalink.